How to steer clear of the Chuck Basses and Christian Greys in your life. 1. You don't feel "matched" in your texts. In your messages, you'll actually go deep into details about how your day was, providing plenty of opportunities for the other person to ask you, well, anything. But a commitment-phobe, according to Brogaard, will have "a tendency not to continue a text message thread, by replying briefly or submissively with 'K,' 'Sounds like fun,' 'Wow,' 'IDK' and so on." So before you let them off the hook for bad texting, consider the fact that they could be emotionally unavailable. 2. Even after a great date, you won't hear from them anytime soon. Brogaard warns that commitment-phobes tend to not initiate contact first and will go through long periods of radio silence after dates—meaning YOU always have to do all the romantic legwork. 3. They're irritatingly vague about their schedule. "I'm really busy at work right now. But let's get together in a few weeks when things slow down a bit." "Sorry I haven't been in touch for so long. Things have been crazy around here. What have you been up to?" "Sorry, didn't see your text 'til now. How are you?" Ok, we've all sent the "omg so sorry, just saw this!" text after a four-hour Netflix binge. There's a huge difference, though, when someone does this all the time, to the point where your main interaction with them is rainchecking. 4. They only plan dates around what's convenient for them. Since their schedule is just ~too busy~, their ideas of dates include inviting you to a bar where, oh wow, *their* team is currently playing and it's suuuuuch a tight game! Who cares that you don't know the full rules of basketball and don't really care? Not this guy, who only tells you when he’s free three hours in advance! 5. 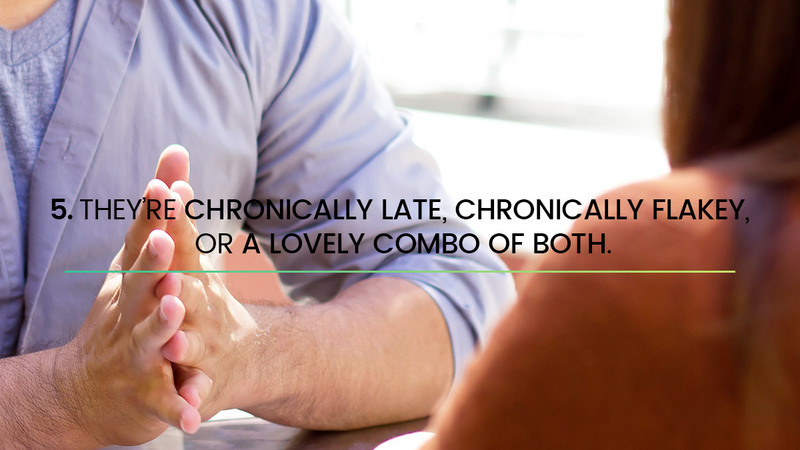 They're chronically late, chronically flakey, or a lovely combo of both. Because they don't want to view dating as "serious", they don't stress over or prioritize getting there on time and don't really care if them canceling screws up their chances with you. 6. They're pretty impulsive, but only when it comes to you. "They may be very conscientious and hardworking at work or in school but then be impulsive when it comes to going out or getting together," says Brogaard. Everything comes before the person they're dating. 7. They constantly reiterate how casual everything is. Another key phrase Brogaard says to be wary of is "Not sure I'm ready for a relationship right now. Give me some time." You'll make your desire for monogamy clear, and rather than breaking things off to spare any hurt feelings, they'll string you along with promises of a "maybe-one-day" relationship. 8. They're "not great” with PDA. "It's difficult for commitment-phobes to show signs of affection, especially in public," says Brogaard. "They will tend not to say 'I love you' back, or they will only say it after drinking or the like. Some can only put it in writing but not say it (or vice versa)." 9. They usually don’t have true, close friends. While "they may still be part of a big circle of people who meet up" according to Brogaard, they don't have friends they've stuck with for a long time and have a deeper relationship with. 10. They won't actually admit fault in their past relationships. "They might blame the other person or simply say 'we weren't a good match' or 'we were just really bad for each other'," says Brogaard. They have yet to experience any crucial post-breakup epiphanies about their own patterned dating flaws. 11. Or they won't even call a past relationship a relationship. That girl he saw exclusively for six months was completely casual, and he has no idea why she freaked out and deleted their whole Eurotrip album when he sent her a breakup text. 12. They had lots of short relationships or pretty shallow long-term ones. "If they had long relationships, they were usually not very committed," says Brogaard. "Even when they were committed on the surface (for instance, engaged or married), you might discover that the two of them led very separate lives." 13. They'll keep saying they want to "take things slow" as an excuse. Of course, cautiously easing into a new relationship is a perfectly normal (and emotionally healthy!) thing to do. But you have to wonder if your relationship is moving anywhere at all. "People who are taking it slow will tend to move forward," says Brogaard. "Commitment-phobes will tend to provide obstacles to any relationship progress." 14. They always need more space than you're giving them. Even the honeymoon period of seeing each other a lot scares them. For commitment-phobes trying to work on their dating issues, Brogaard recommends dating someone who "is very busy in their own life", so that space is never an issue. 15. They complain about the pressure to be in a monogamous relationship a lot. Obviously, societal norms can be annoying, but if they talk negatively about marital expectations more often than any of the upsides of a strong partnership, it kind of shows that they deep down think monogamy never really works out. 16. You can tell that something about relationships clearly freaks them out, but they can't articulate it. The first step to recovery is admitting you have a problem, after all. Brogaard suggests possible questions to ask a commitment-phobe about their fears of relationships: "Is it that they impose on your need for alone time? Is it that you have intimacy issues? Is it that you set unrealistically high standards for potential partners? Once you realize what it is, you can work on that particular issue (for instance, make sure that your partner is willing to give you plenty of alone time, if that is what you are craving)." Commitment-phobia is definitely curable if a person wants to work on it and explore why they think that ALL relationships will end up being disappointing. But that dude sending you another "haha :)" before ghosting for two days is probably not on that path right now.